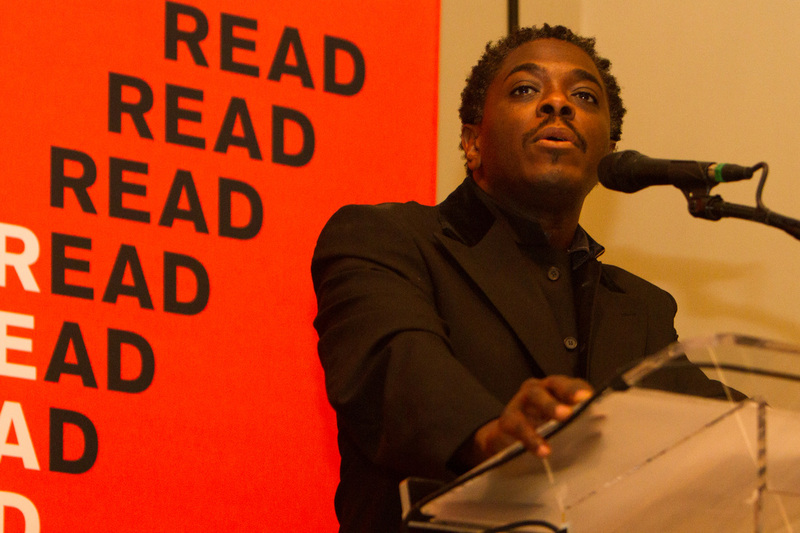 Poet, songwriter, author, workshop facilitator, and educator Regie Gibson has performed, taught, and lectured at schools, universities, theaters and various other venues on two continents and in seven countries including Havana Cuba. Regie and his work appear in the New Line Cinema film love jones, based largely on events in his life. The poem entitled "Brother to the Night (A Blues for Nina)" appears on the movie soundtrack and is performed by the film's star, Larenz Tate. Regie performed "Hey Nappyhead" in the film with world-renowned percussionist and composer Kahil El Zabar, composer of the score for The Lion King musical. Regie has worked with: Gwendolyn Brooks, Roy Ayers, Fareed Haque, Kurt Vonnegut, David Amram, The Monks of the Drepong Gamong Monastery, members of the world famous AACM (Association for the Advancement of Creative Musicians), Mos Def, David Murray, Sterling Plumpp, Marc Smith, Mark Strand, Reg E. Gaines, Savion Glover, John Legend and many other artists in musical genres including World, Celtic, Jazz, Blues and, Salsa, and classical European. Regie is a former National Poetry Slam Individual Champion, was selected one of Chicago Tribune's Artist of the Year for Excellence for his poetry. He has co-judge the Chicago Sun-Times Poetry Competition with Marc Smith and Mark Strand, has been regularly featured on N. P. R. and has appeared on HBO’s Def Poetry Jam. Regie has toured with the Chicago Mask Ensemble, performing dramatic and poetic adaptations of common myths from around the world. He co-produced the play "The Mystery of Fire Bread" while performing in Europe with the Sharnier Theater in the cities of Hanover, Frankfurt, Berlin, and the Literature Haus in Hamburg, Germany. His original works of poetry have been dramatized and scored by classical flautist and Professor Janet Misurell-Mitchell and produced and directed by Eric Rosen for the Steppenwolf Theater's Words on Fire production. In 1999 Regie performed for the award-winning Traffic Series at Chicago's Steppenwolf Theater where he adapted the work of Kurt Vonnegut. Regie founded the LiteraryMusic Ensemble Neon JuJu: a literary and musical arts ensemble utilizing classic, contemporary and original literary text combined with Middle Eastern, Contemporary American and European classic music. Regie is widely published in anthologies, magazines and journals such as The Iowa Review, Harvard Divinity Magazine, Poetry Magazine, Spoken Word Revolution (Source Books), The Good Men Project and several others. His full-length book of poetry Storms Beneath The Skin (EM Press) was published in 2001 and received the Golden Pen Award. In 2005 Regie was a featured on the PBS Arts magazine- Art Close-Up and was subsequently nominated for a Boston Grammy. In Spring of 2008 Regie competed in and won the “Big Boat” international poetry competition held in Monfalcone, Italy. Regie has received his MFA in Poetry from New England College, and continues to facilitate creative writing workshops, performances, and otherwise augmenting literary curricula for high schools and colleges across the United States.